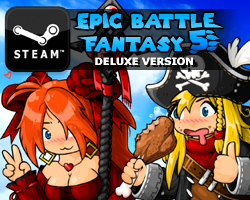 Hey, it looks like the Japanese translation of EBF5 might need to be cancelled. We’ve got a few people on the team, but we only have one native Japanese speaker, and it’s a bit too much responsibility for him alone to double-check everything. So unless I have one or two more native Japanese fans out there, we probably don’t have the manpower to do a good translation. Get in contact with me at kupo707@hotmail.com if you can help. This entry was posted in Epic Battle Fantasy 5 on October 1, 2018 by Matt Roszak. 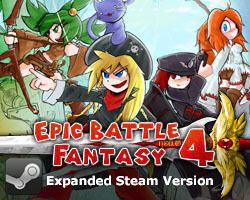 EBF5 is anime game. Im not Japanese, Im actually russian, but it will be a big shame, if there will be no japanese translation! Make it happen! I believe in you! Well actually one is enough if you give him a little more time and add it to an upgrade version. I did most of my presonal tranlation within a summer vacation with a friend helping out. Japanese really match this game, so don’t leave any regrets. I just hope the game will be released soon.Youtube is already filled to the brim with spoilers and they are not even hiding things..I saw the final boss once accidentally in my recommendations..And other bosses as well.I mean sure i can just not look at my recommended videos hahahaha. Well, I alone made a Polish translation for Secrets of Grindea, which is an action RPG game with amount of text comparable or greater than EBF5. If he is really willing to do that and you add the translation post-release (to not delay anything), it’s possible to accomplish it by one person. I’m not a native japanese speaker, so I guess my help isn’t what you seek. Japanese translation is so fast. Where is the Vietnamese? Though I’m a layman….but I think,Japanese translation version could be based on Chinese version? There’re so many Chinese translation team doing works that is translating Japanese to Chinese. But I don’t know translate Chinese to Japanese could be how hard to them.Maybe they could cooperate with origin Japanese translation team. I think Chinese translation team may know more about this,try to discuss with them? 2. It’s a translation of the -english- version, so it would translating to another language something that already have been translated, and so have lost some of its original meaning. could it be a second best ? Some Games’ oringin language are Japanese , but their Chinese version are based on English version. Though most of them may make we feel bad,there are also a few of them are fluency——it’s up to embellishment level. To be honese,even if a game has a low-quality Chinese version,we are more happy than it don’t have. Be relative to canceling Japanese version,I think translate it by another language version is a better choice. “ how you pronouncate them” are mostly limited in words.To be honest,I don’t think it could make big troubles to translation works——if we know the whole ‘meaning’(this word in Chinese may have a lot of meaning,but we can easily Distinguish them and find correct word in English)of sentence.In translation part of our exam,the most difficult problem to us is to translate Homegrown word and vulgarism.At this point,direct translation also has same difficult problem. Update: We now have 5 native Japanese editors on the translation team and things are looking up for the Japanese translation. Thanks to everyone who responded to the calls for help via social media and Discord! @marcoatom re: doing a Japanese translation from a Chinese translation, the sentiment is appreciated but that’s frankly not a good idea and to be avoided if at all possible. I am fluent in both, and while they do share some vocabulary, they’re linguistically not closely related. More importantly, native Japanese editors are ideal since the target audience of the translation is primarily Japanese players. Anyway, the point is now moot as we have more than enough manpower. Thanks for the suggestion! Hey , Matt , what other languages do you plan on adding in future updates ? There might be some people that might help you with those languages that you didn’t mention yet !